NMC Healthcare is the largest private healthcare company in the UAE and ranks amongst the leading fertility service providers in the world. NMC is the first company from Abu Dhabi to list on the London Stock Exchange and is now part of the premium FTSE 100 Index, an elite club of top 100 blue-chip companies by market cap. With a legacy stretching as far back as 1975, NMC Healthcare has been chalking out distinct strategies that reflect its continuing leadership in the market. We believe that healthcare is simply not about detecting, diagnosing, informing or treating an individual but it is about helping people to lead a wholesome and healthy life. Dr. Osman got his Membership of Royal Colleges of Physicians United Kingdom. He has completed his MRCP UK 1st and 2nd Written Parts in 2012. 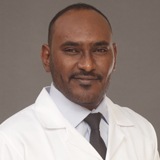 He has more than 5 years of clinical experience in Sudan, KSA and UAE as General Practitioner. Dr. Osman is fluent in Arabic and English.